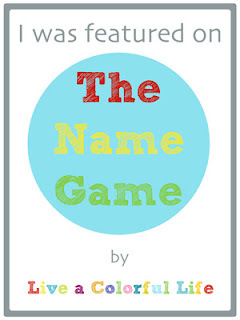 Today we have someone totally shocking here at the Name Game. Katie from Shocking Hocking is here. The name of her blog has intrigued me for a long time. How did you choose the name, Shocking Hocking? 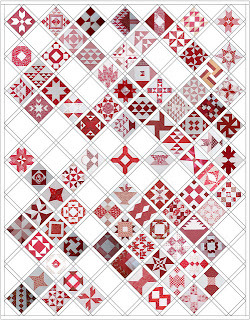 Katie is doing Farmer's Wife blocks in red and white--really beautiful! Many years ago, before kids came along, I worked in a local bank. Both my husband and myself were members of the Army Reserve (I think it’s called Home Guard in the US, and the Territorial Army in the UK) and we used to have some wild times – whether it was experiencing army life (ie, getting a ride on a Chinook helicopter, spending time on the live firing range with a variety of weapons, bivouacking in diverse places etc, etc) or partying (military types know how to party!!) I used to share my stories (well, some of them ) with the folks in my ‘real’ job. One of my colleagues was so shocked surprised about my exploits (bank employees in general were quite circumspect in those days!) that he christened me ‘Shocking Hocking’ (my surname is Hocking) and the nickname stuck. I’ve used the name for various reasons in the past, such as when I made children's clothes to order, so when I was looking for a name for my blog, it popped into my head and I went with that. 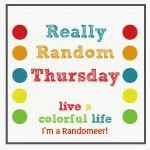 I have since considered other names – my bff says that ‘Shocking Hocking’ doesn’t really reflect my brand very well – so I’m toying with a change to something like ‘Sew spoilt’ or ‘Katie: In stitches’ – but other than snagging the blog name, I haven’t done anything else about it. Aren't the pleats on this bag creative? There is a tutorial here. Now that you are recognized by Shocking Hocking, are you happy with it, or do you wish you could change it to something else? With reference to answer 2, I’m kind of partial to the Shocking Hocking name so not really sure whether I’ll pursue a name change....but I never say “never”! Please head over to say hi to Katie at Shocking Hocking and spend some time looking around. Thanks again, Katie, for playing the Name Game this week! Heh, I always wondered about that name too! Oh I hope Katie never changes! This is a new to me blog. Thanks for the introduction. I always enjoy the Name Game. I hope she keeps this name too.....it's very fun and original! I love those pleats on that bag! Katie's a wonderful blogger. She participated in my Red/White Challenge last year, and I've followed her ever since. So fun to see her here! 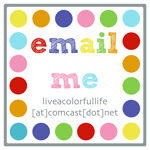 I love Katie's blog and her blog name! These posts are always fun. I hope she doesn't change the name of her blog, because I like it, and the story behind the name is great! Already a blog fan of Katie and Shocking Hocking is an original and perfect name.